Yesterday morning I announced I had won Charlie Sheen’s #TigerBloodIntern. It has been a roller-coaster ride up until this point, but there is something you should know. From the outset this has been a carefully orchestrated stunt and you’re probably wondering why? Anyone who knows me and the research I have been conducting on the masters will know that my focus has been on social media and the cult of celebrity. I am interested in the public’s fascination with celebrity. Social media now plays a huge role in celebrity status. This social phenomenon has been something I wanted to further research and the Charlie Sheen internship provided me the perfect platform to do this. Essentially I wanted to leverage the tools celebrities utilise—Twitter, Facebook and YouTube—to publicise my story. 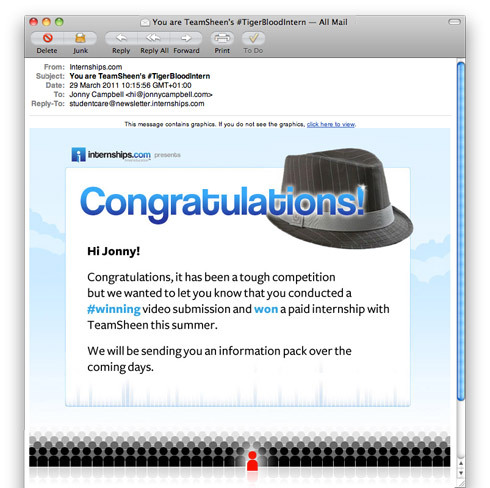 After I had my videos in place it was a simple matter of designing the winning email from TeamSheen and internships.com congratulating me. I included the fact that there would be information to follow to keep the details I would have to divulge to a minimum. I was able to harness my skills as a graphic designer to convince my audience that I had won. Seeing is believing. Over the past several weeks Charlie Sheen has been propelled from a celebrity to God-like status in the social media hemisphere. His incredible rants, one-liners, gimmick words and unpredictability made him go viral overnight, even setting a Guinness World Record along the way. I can’t help but think his behaviour is somewhat akin to what Joaquin Phoenix was trying to achieve a few years ago when he announced he would be retiring from acting to pursue a career in music. We would later find out that his “retirement” and eccentric behavior were for a mockumentary, I’m Still Here, that he and Casey Affleck filmed. Anyone else think Charlie Sheen is pulling a Joaquin Phoenix? The difference, of course, being that this has been executed with perfection. I’m in two minds as to whether Charlie is actually pulling off the acting performance of his life or this is all for real, but either way it’s damn fine entertainment. In the 1971 film, Willy Wonka & the Chocolate Factory, the Paraguayan millionaire breaks the news that the final ticket had been found, dashing the hopes of everyone hoping to find it. It wasn’t until the next day that the truth transpired which revealed that the ticket was a forgery. The race for Willy Wonka’s Golden Ticket and Charlie Sheen’s #TigerBloodInternship aren’t all that dissimilar. The whole affair is absurd yet wildly entertaining. …hard-working, self-motivated, creative, resourceful and social media savvy individual. This was my attempt at demonstrating how I can create buzz and conversation using a creative approach to social media, even if it meant tricking people into believing something that wasn’t true. NewsWhip: Charlie Sheen Internship fake? Mode Bay Area: No more golden ticket? Jonny Campbell is a web designer, lecturer, blogger, and brand engagement strategist living in Belfast, Northern Ireland… Read more.